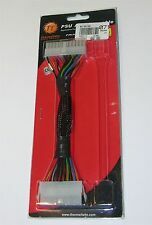 Thermaltake PCI-E x16 3.0 Black Extender Riser Cable 200 mm New open box. This updated design adds more compatibility, performance and High quality you expect from Thermaltake. ‣ Keyboard / Mouse. OutletPC was founded in 2001 and since then we've been focused on getting people around the world great deals on computer products, systems, and hardware. 18" Thermaltake TR2 RX Etc. 300 Volt 18 AWG USA 1107 UL Listed Oxygen Free Copper Wire. IF YOU WANT TO BUY A CUSTOM CABLE READ THIS . unique cable that is not listed?. M essage us and we will go from there. I bought this item many years back but I only needed one of the two adapters that was included. 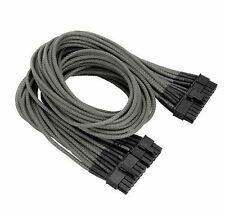 You receive just the 20-pin to 24-pin cable as pictured. Item was opened in order to remove the other adapter but the adapter being sold has never been used. The new Thermaltake individually sleeved cables are all engineered with black heat-shrinks to ensure high quality cable assembly and support for high currents to achieve great performance and stability. Customize your system build with the Thermaltake sleeved modular cable set. The new individually sleeved cables are heat-shrink free to ensure high-quality cable assembly and support for high currents in order to achieve superior performance and stability. This item may be lighter or darker in person. This is due to a number of factors such as; lighting, different monitor resolutions and/or cell phone screen resolutions. Condition: New. Available in 300mm, 600mm and 1000mm length, the TT Premium PCI-E 3.0 Extender series supports a wide range of GPU solutions and matches the cable included in any chassis. Thermaltake TT Premium PCI-E 3.0 Extender 300mm. 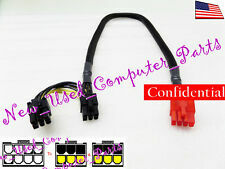 Product Title Thermaltake Gaming PCI-E 3.0 X16 Riser Cable (AC053CN1OTNC1). Support a wide range of GPU solutions and match the cable included in any gaming chassis. Features like, high-speed cable, EMI shielding cover, durable usage and easy installation are made for exceeding your expectations. 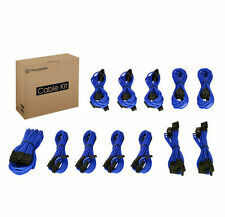 Marketing Information Customize your system build with the Thermaltake sleeved modular cable set. The new individually sleeved cables are heat-shrink free to ensure high-quality cable assembly and support for high currents in order to achieve superior performance and stability. Thermaltake Gaming PCI-E 3.0 X16 Riser Cable (ac-053-cn1otn-c1) (ac053cn1otnc1). Shipped with USPS Priority Mail. (4)Compatible: NVIDIA Quadro GP100,P6000,M6000,P5000 SERIES. 5)Male to Male. 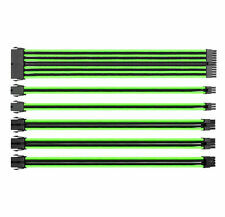 Thermaltake A2167 12" UV Yellow Power Splitter with LED. Learn more about theThermaltake A2167. Power Splitter. This 300mm "Y" shaped power cable splits one male 4-pin connector into two while extending the length of the internal power cable. (5)Also suitable for GeForce GTX 760 Ti (OEM),GeForce GTX 760,GeForce GT 740,GeForce GTX 760 192-bit(OEM),GeFORCE GTX 1080,GeFORCE GTX 1070. 4)Compatible: NVIDIA TITAN Xp,GTX TITAN Black,NVIDIA TITAN X,GeForce GTX 1080 Ti,GeForce GTX 780,GTX 780 Ti,GTX 780,GTX 770 GPU Series.